Is the United States of America (US) and its NATO Allies replacing the United Nations? Is this alliance now the supreme world body in international affairs? Is the United Nations going the disastrous end of its predecessor the League of Nations? Should the civilised nations of the world allow the nefarious schemes of these self-appointed police of the world to destroy the world again through disguised colonialism, racism and new imperialism and enslave other nations especially in the developing world through terrorist militarism? The US and Britain invaded Iraq in 2003 after spreading a false propaganda that Iraq possessed weapons of mass destruction such as chemical and nuclear weapons and murdered Saddam Hussein for this fraudulently fabricated “crime.” This year 2013 marks the 10th year anniversary of the invasion and occupation of Iraq by Britain and US. It is reported that 2.7 million Iraqis – women, children and men have been killed over this period. The US alone lost over three thousand soldiers. It is noteworthy that many of the US soldiers sent to die in a war that had nothing to do with their interests were African-Americans. Before the Iraq invasion, the United Nations sent its scientists to Iraq and found there were no weapons of mass destruction. That notwithstanding, Tony Blair of Britain and George Bush of the US went ahead and illegally aggressed against Iraq. They were never summoned to the International Criminal Court (ICC) to account for the atrocities they perpetrated upon the Iraqi people. The US has not even signed the Statute of the ICC, but it is very vocal about non-US-NATO leaders being brought before this court to answer for alleged crimes against humanity. In Britain Tony Blair’s Party lost the last elections because the British electorate considered him as having lied to them about weapons of mass destruction in Iraq. David Cameron of the Conservative Party won the last British elections. Recently, he tried to involve Britain in the controversial use of chemical weapons in Syria. He failed to convince the British Parliament. France has also had a split in Parliament on the issue of who used “chemical weapons” in Syria. Sixty four percent of the French people are reported to be opposed to the apparent intention of the US to launch a military attack on Syria. Cameron was keen to see atrocities punished in Syria, but not those Britain committed in her colonies such as Rhodesia, South Africa and Kenya. 5200 Kenyans have recently been awarded reparations by a British High Court for atrocities committed in Kenya by Britain on the freedom fighters of this African country which fought against British colonialism and imperialism in their country. They are the former Kenya Land and Freedom Army that the British colonial regime internationally discredited as “Mau Mau terrorists.” These African Freedom Fighters were led by Kenyan leaders such as Dedan Kimathi whom the British colonial regime sentenced to death for resisting British imperialism in his country. “In 1903 the British colonial government sent thousands of settlers from South Africa and from England to Kenya with the aim of creating another ‘white man’s country’ in Kenya. The European settlers were allocated the most fertile land in an area they colonially named ‘White Highlands,’” writes Ms Jemima Pierre editor at the Black Agenda Report in Uganda. Iraq is a leading case study to prove beyond reasonable doubt that false information can be fabricated to mislead the world by the US and its Allies to destroy governments they do not like including those in Africa such as Zimbabwe and Libya, as well as those like Iran in the Middle East. Libya is the 10th largest producer of oil reserve in the world. Under Muammar Gaddafi, the oil wealth was controlled by Libyans and not by the US and NATO. The US and its allies, mainly Britain and France moved into Libya under false cover of United Nations Resolution “no fly zone” and “protection” of Libyan civilian population. More civilians have died in Libya under the US-NATO “protection” than under Gaddafi. Most objective observers of events have noted that Libya “has moved on, but into lawlessness and economic ruin.” The civil war in Syria has been fuelled by Western countries. They have openly trained and supplied weapons to the Syrian rebel forces. This is exactly what they did also in Libya. But in Saudi Arabia, the US and NATO adopted a different attitude when Saudi Arabia used life ammunition against pro-democracy protesters, and banned demonstrations. During the same time NATO and the US accused Gaddafi’s Libya of “killing his own people.” They turned a blind eye even when Saud Arabia sent its own troops to Bahrain which was being overwhelmed by its own people. Someday it will be proved that the rebels in Syria used the chemical weapons in order to give the US and NATO the fraudulent excuse to attack President Bashar el-Assad’s Syrian government. It is the rebels that the US relies on to facilitate their “regime change” strategy for themselves and for their oil-hungry masters to control oil wealth in Syria. The US Defence Secretary Chuch Hogel, has been reported as saying that the US forces in the region are now waiting to be given the order to attack Syria. This is regardless of what the United Nations will report about these “chemical weapons.” Clearly like in the case of Iraq and Libya, the US and NATO were determined to undermine the authority of the United Nations. The US is now claiming that they are acting according to international law. Which international is this, which is the sole prerogative of the Americans and their NATO allies? Which international law authorises them to violate the United Nations of which they are members? International law is the law of all nations. It is not the law of Europeans or those of European descent living in Canada, Australia or America after exterminating the indigenous people of these countries by theft of their lands and terrorist militarism. At the United Nations, the Security Council is the supreme body of this world body. It has rules. Five members have a veto. It seems, however that to the US and NATO, only the veto of Britain, France and United States of America matter, not that of Russia and China. 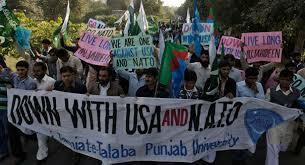 This imperialist attitude by the US and NATO does not contribute to the peace, prosperity and order in the world. Any military strikes by the US and its NATO Allies in Syria will be illegal. They have no authorisation of the Security Council of the United Nations. The US must stop preaching “legality” and “good governance,” especially to Africans; while walking illegality and dancing illegality and violating all principles of international law with impunity; and arrogance intoxicated with the exuberance of military superiority. The Russian Federation has come up with a reasonable proposal and Assad has accepted this proposal. Russia has proposed that Syria must bring all its chemical weapons under international control and burn them. Russia’s proposal however, must go beyond this point. All nations of the world with weapons of mass destruction must do as they demand of Syria. They must burn their chemical and nuclear weapons, so that more money can be spent on the economic development of nations and social emancipation of its people from poverty, disease and ignorance, than on weapons of war. The writer is a historian, political scientist, lawyer, theologian, author of several books among which is TOWARDS AFRICA’S AUTHENTIC LIBERATION and a former Member of the South African Parliament. During the unfinished liberation struggle in South Africa he was a Representative of the victims of apartheid at the United Nations in New York and at the United Nations Commission on Human Rights.